Small but mighty, this portable speaker amplifies the sound from your phone without plugs or batteries. The huge boom box propped on many an '80s-print-wearing shoulder has matured into this discreet, ceramic Boom Bowl. Small but mighty, it'll amplify the sound from your phone or MP3 player by 15 decibels, and it's totally portable—no plugs or batteries required. Choose a matte black finish or chalkboard, which is just asking for a playlist or lyrics. I want my MTV anyone? Or are we leaving that one with the boom box? Made in China. Amplifies sound by 15 decibels. I use this outside while I'm gardening. 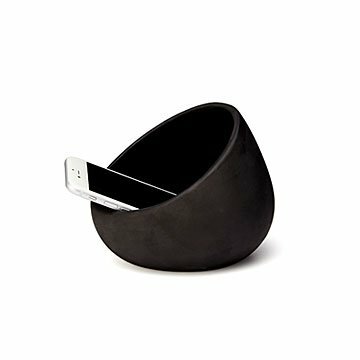 Great for boosting the sound from iPhone while listening to music. great product for my desk at work. This boom bowl works great and the kids love writing on it with chalk.